Authentic hostel experience combined with Ulcinj's most beautiful and longest beaches on the Montenegro coast. on at any time. On arrival we will give you lots of local information to help find the hidden gems, We will organise cheap and beautiful boat trips just for our guests! Free beer at night to help bring people together! Mala Plaza (nearest beach) and 15km from Ada Bojana which is one of the nicest beaches on the Montenegrin coast. 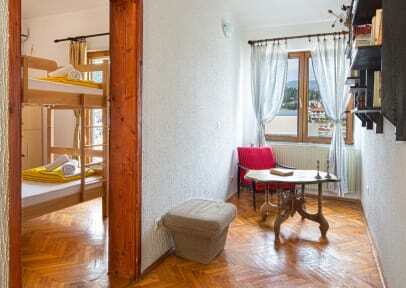 Rooms are spacious and very nice, decorated with a view of the city center, and many rooms have balconies. All rooms have air conditioning and shared bathroom. Hostel Pirate Policies and Conditions. Cancellation policy: Cancellation outside 72 hours will incur the full charges of the first night . Great hostel, really good atmosphere and the boat trip was awesome. And their hedges are trimmed to perfection! Such a friendly host and packed with amazing people, such a great time! Out of all the hostels i have stayed at in my life this is by far the best!! - the owner Diana is super friendly, helpful, professional and with her hart at the right place! She really makes a effort to make u feel at home which benefit to the atmosphere. - Linda the cleaning lady is a absolute hero!! She keeps the place shiny. Never ever seen such a clean hostel. -the building has a nice character -room has airco -towels are really proper size towels -the garden and all its fruit Amazing! The best hostel, nice atmosphere and such a nice staff. Free beers at nine! It’s a very nice way to get people together! You talk, get to know each other, play boardgames. The staff is also very friendly. The owner is also very funny! It was a very nice experience there!